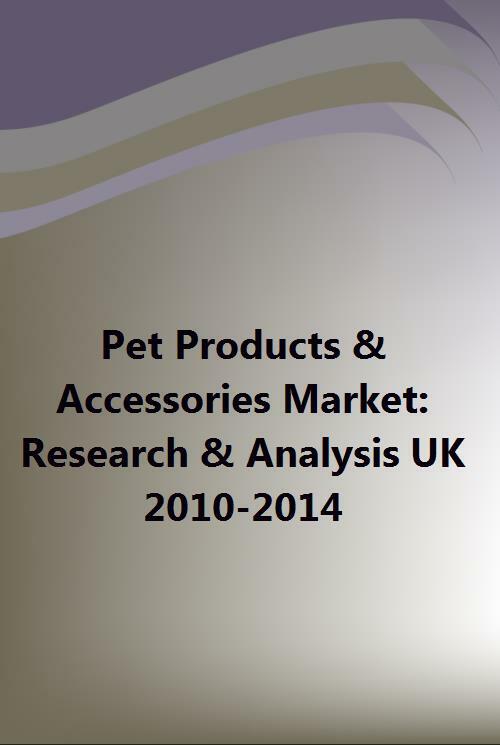 MTW Research have published a brand new Research & Analysis market report providing a fresh, comprehensive & reliable review of the UK Pet Products and Accessories Market in 2010 with forecasts to 2014. Written specifically for pet product manufacturers, retailers and distributors, the report is available immediately in a variety of formats for use in reports, presentations & is designed for sharing with colleagues. Based on industry sales and a wide range of secondary sources, the report illustrates and analyses market size and trends for the pet products and pet accessories market, supported by relevant and incisive qualitative discussion on key market influences in late 2010 with forecasts to 2014. 1 page profiles for 60+ leading retailers and pet product suppliers are provided, along with 4 years financial history to illustrate the recent performance of the market. Discussion of the key macro and micro market influences impacting the sector are provided with thought-provoking qualitative comment on future opportunities and threats, including a SWOT & PEST analysis. This report combines the best of both, with statistically relevant quantitative data from the industry, coupled with relevant and insightful qualitative analysis. Coupled with our price guarantee, we simply can't be beaten on quality of research, data interpretation or price. This unique, first edition report represents the only comprehensive yet affordable ‘off the shelf’ report reviewing the UK Pert Products & Accessories Market which combines quantitative financial analysis from 60+ pet product suppliers, an in-depth review of the pet retailer industry supported by qualitative research and trend comment. The methodology for this report included analysis of sales, profit & balance sheet data from the industry, coupled with primary research information from Government sources, manufacturers, retailers and other trade sources. This was supported by secondary research from trade journals, company reports, Companies House, Government statistics, trade associations, company websites and existing knowledge in this sector. The report is also unique in that a 2009 turnover estimate is provided for every company reviewed. - Share by Key Distribution Channel 2004, 2010 & 2014 - DIY, Pet Stores, Internet, High Street etc. - Price Guarantee - We pride ourselves on offering the highest quality reports at the best price available. Found a Similar Report Available at a Cheaper Price? We'll Match It & Offer a Further 20% Discount. - Strategic Market Review - A professional strategic market review was undertaken by marketing professionals with real world marketing experience and degree qualifications in strategic marketing. This report is not simply a collection of statistics and comments but a structured review of the market, written by marketing professionals, for industry professionals. - SWOT Analysis - Only after a thorough, strategic market review can industry strengths & weaknesses and market opportunities & threats be identified. No other 'off the shelf' report offers such a comprehensive SWOT analysis in an easy to read and disseminate format. - PEST Analysis - We've been writing market reports for over a decade and we know its the quality of the data collection, analysis and interpretation which are the important aspects of any good report. Our strategic review, based on statistically relevant industry sales data enables us to identify the key market influences relating to politico-legal, economic, environmental, social and technological issues and present these in a easy to read chart format - its all here, in black and white. - Experienced Marketing Professionals - We use professional marketing theories and employ the necessary marketing models so you don't have to. Established marketing theories are applied to the market to enhance understanding of the likely strategic options which will generate market growth in the near-medium term. We do the hard work, you take the credit. - Quantitative Market Data - The foundations of all our reports are based on sales from as representative a sample of the industry as possible. We have invested heavily in order to ascertain financial sales data from companies involved in the market and ensure our methodologies are as robust as possible. The sales data and financial profiles from more than 60 companies are included in this report with a combined turnover of more than £2.2 billion reflecting a sample size of more than 70% by value of the UK pet accessories market in 2010. No other 'off the shelf' report available combines such a high level of qualitative comment based on such firm statistical confidence at such a low price.